The WOW Zone team is proud to announce that one of their two short listed films, which were produced by groups that attend their After School WOW Zone sessions, was declared the national winner at this year’s prestigious British Film Institute’s Kids for Kids annual film competition. The event was held on Saturday, 15th November at the British Film Institute’s headquarters on the Southbank in view of the River Thames in London. 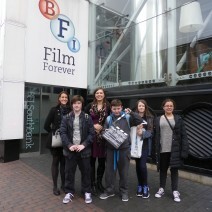 Four young people, accompanied by WOW Zone teachers Lisa Whittaker and Louise Zwanepoel, travelled down for the Award ceremony and a live screening of their award-nominated films. The WOW Zone entries into the BFI competition included ‘World War One’ by Liam Hildebrandt (aged 12) and ‘A Mario Movie’ by Elise, Erin and Jacob (aged 12). As well as receiving certificates, Elise, Erin and Jacob were also presented with a clapper board which displayed details of their winning film. Congratulations also went to Liam Hildebrandt, who also had his film ‘World War One’ shortlisted and showcased at the event.